The inconspicuously named 23rd Avenue in the outlying neighbourhood of Berino is blessed with one of the most spectacular views in all of Sensuka. The street runs along the crest of the high hilltop upon which Berino is situated, and then snakes its way downwards in a progression of wide curves in the direction of the city centre. On clear evenings, the sun’s dying rays fall upon the paving stones in such a way that 23rd Avenue appears as a curling ribbon of burnished gold, drawing the eye down towards the reddening tops of the city spires and the shimmering sea beyond. Berino is not a wealthy neighbourhood, however, far from it, and for the residents of 23rd Avenue returning home after another soul-crushing workday, one that in many cases began well before sunrise, this beautiful evening spectacle can sometimes seem more of an irritation than anything else. One has the slightly oppressive sense that one ought to stop for a moment and contemplate the view; its insistent magnificence appears almost to demand it. The glowing sunbeams seem to tap importunately at one’s shoulder, pestering for one’s attention. And so one finally turns, and looks. It really is breathtaking, even after all these years. And there comes again that vague impression, the one we had once found so inspiring, that all of this beauty, laid out with such sumptuousness before us, constitutes a kind of homily, an exhortation perhaps to cast one’s sight on greater truths, on those grand, fundamental things that make life truly worth living. But what are they? Where are they? And what has the contemplation of this beauty ever given us, really? In the long run, nothing but bitterness. 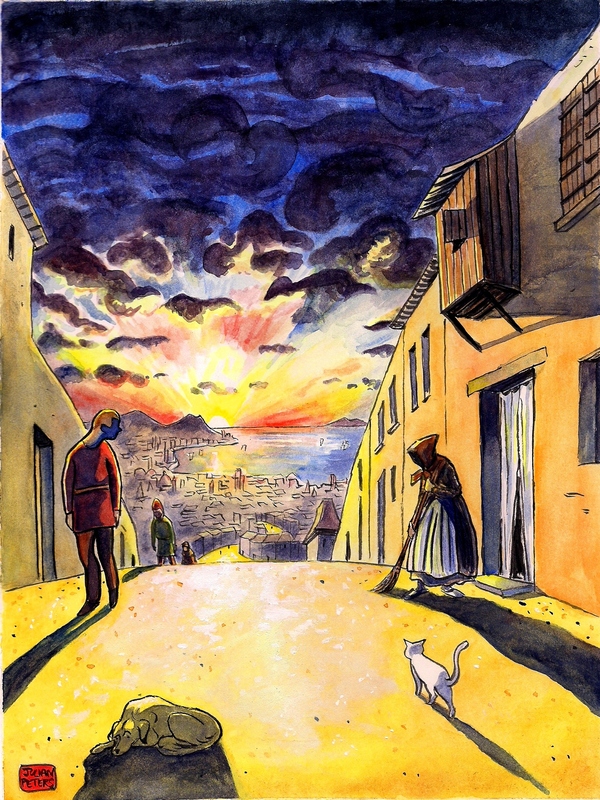 This entry was posted in illustration, Imaginary City and tagged sehnsucht, sensuka, sunset. Bookmark the permalink. C’est vrai qu’une musique d’accordéon accompagnerait bien cette image! La semaine suivant cette vue, le couchant avait un contraste semblable. En la ragardant, j’entends l’accordéon de Gotan Project ou celui d’un véritable tango. La journée de travail harassante qui se termine en est ressentie comme un plaisir, le sommeil sera profond. La vraie vie quoi!